The main ingredients are Ashwagandha, Gotu Kola, Rhodiola Rosea, and Kalawalla (or Calaguala), which emerged resistant, versatile, and sublime in the adaptation process from their respective regional growth conditions. Vitamin K2, Silica, Vegan Biotin, and Seabuckthorn have been included as fortification agents. Concept II is vegetarian and vegan friendly. - protective, calming, and stabilizing capabilities (e.g., anti-inflammatory antioxidants, mental health, physical resilience). It is also known as Indian Ginseng, a revered herb of the Ayurvedic system with proven anti-stress effects and enhancement in performance. Role in Concept II is antioxidizing, stabilizing and ultimately balances the entire organism, reduces cortisol levels, boost capacity and thus a step against premature aging. It is also known as Artic Rose. Its role is stimulating, antioxidating and resilience. Enable the organism to fight against mental and physical fatigue and thus, another step to prevent premature aging. It is in use since three thousand years ago; chemical composition shows effects in improved healings of minor wounds like skin blemishes, eczema or even burns, it has promising anti-inflammatory and antioxidative properties, in cosmetology usage may have positive effects on reduction of cellulites, scars and striae. Lastly, induction of collagen production. Its role is natural sunscreen e.g. against UV-induced skin damages, also anti-inflammatory and antioxidant thereby protecting the outermost layer of skin against hazards, also known to relieve skin symptoms like flaking, irritation, redness and itching. Round-up with Biotin, Seabuckthorn, Silica and Vitamin K2, each in their respective properties as augmentation / enhancement to promote aesthetic e.g. hair, nails, skin etc. What is Artefact's Concept II? Artefact's Concept II: Anti-Aging & Aesthetics is calm and subtle; its elegance is defined by fighting for "Beauty From Within". Artefact’s Concept II is a bespoke adaptogen-based product formulated less as a beautifying and rejuvenating supplement in the classical sense of cosmetics and more of a combative, corrective, calming, and enhancing agent that works against premature aging while maintaining the equilibrium and resilience of the body and mind. What do you mean by "Beauty From Within"? Concept II emphasises on “Beauty from Within”. A short example, we concentrate on how to naturally boost the body to produce your very own collagen, rather than offering collagen pills straight to anyone. The human body needs to be in a de-stressed, resilient, if possible balanced stage to enable optimal prevention of premature aging, therefore Concept II does not stop at promoting Beauty, it also helps to defend, protect, repair, strengthen the organism, in short also put both body and mind in harmonious state. How many capsules in a bottle? The recommended dose is 2 to 3 capsules per day, split into 1 or 2 intakes. Some of our customers take only 1 per day. Do not exceed the recommended daily intake or dose. Can I take it during pregnancy or while breast feeding?? Artefact’s Concept II: Anti-Aging & Aesthetics should not be used during pregnancy or while breast-feeding. Can I take Artefact’s Concept II while I am taking prescribed medication or if I have medical conditions? If you are taking any prescribed medication or have any medical conditions always consult your doctor, pharmacist or health care professional before taking vitamins or supplements. 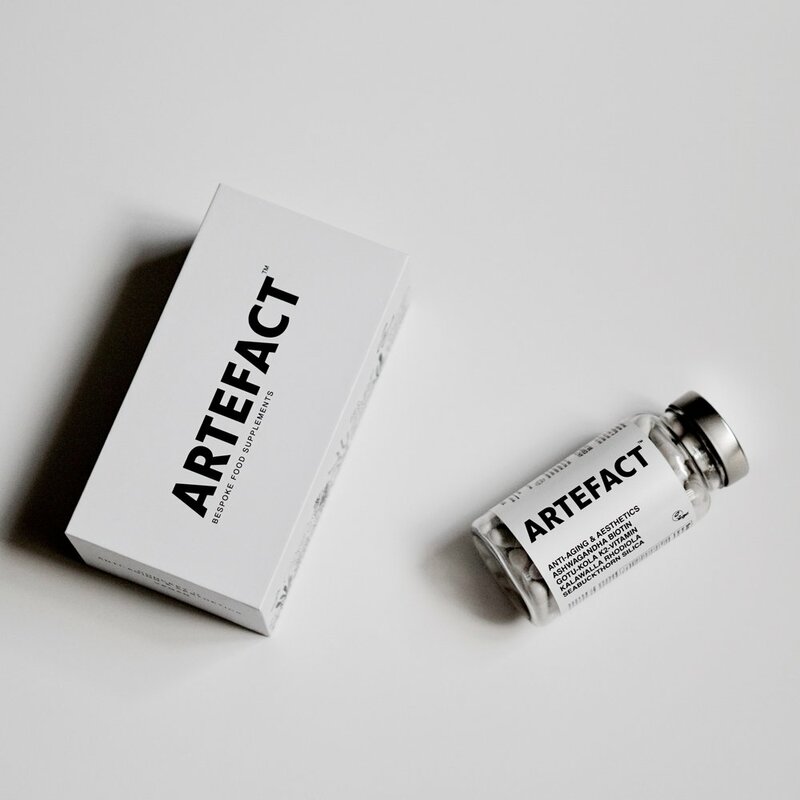 Is Artefact’s Concept II formulated for everyone? Artefact’s Concept II is formulated for both male and female who are 18 and above. Is Artefact’s Concept II vegan friendly? Yes! Artefact’s Concept II is suitable for vegan, it is registered by The Vegan Society - One of the world oldest and most reputable vegan organisations. Will there be an immediate effects? Adaptogenic plants (some called them superfood) and vitamins do not usually provide immediate effects as they do not work like medicines. They usually show effects in later stage after consuming for a certain period of time, possible effects include increased resilience, increased well-being, increased cognitive capacity and more energetic. However, some of the volunteers from the research panel reported that they felt the difference when they increase the number of pills per intake. Everyone reacts to food supplements in very different ways. Although we use ingredients that are mainly derived from plants, yet we are unable to tell that there is no side effects. Subject to different health situations and medical conditions, we suggest you to consult your doctor before taking any vitamins and food supplements. Can I substitute Artefact's Concept II for some/all of my fresh diets? How do I store this product? Please keep this product out of the reach of Children. Store in a cool dry place, keep it away from heat and direct sunlight. Always seal after use. What is the shelf life of Artefact's Concept II? A normal shelf life is 24 months starting from the production date, the expiration date is printed on the bottle and and the packaging. However, Cocnept II is best consumed within 90 days upon opening. What are the main ingredients in Artefact’s Concept II? The main ingredients are Ashwagandha, Gotu Kola, Rhodiola Rosea, and Kalawalla (or Calaguala), which emerged resistant, versatile, and sublime in the adaptation process from their respective regional growth conditions. Vitamin K2, Silica, Vegan Biotin, and Seabuckthorn have been included as fortification agents. Where are these ingredients sourced? Products are originally coming from all around the world. However, we sourced all ingredients in the United Kingdom via our reliable manufacturer in order to ensure the ingredients are approved for production and being monitored under the EU strict regulations. Other than the main ingredients, what else is in it? There are anti-caking and bulking agents in the products. Ashwagandha Root 4:1 Extract, Bamboo Extract 75% Silica, Vegetable Capsule Shell (HydroxyPropyl MethylCellulose), Bulking Agent (Microcrystalline Cellulose), Gotu Kola 4:1 Extract (Maltodextrin), Vitamin K2 1500μg/g (Arabia Gum, Dextrin), Seabuckthorn 10:1 Extract (Maltodextrin), Anti-Caking Agents (Magnesium Stearate, Silicon Dioxide), Rhodiola 15:1 Extract (Maltodextrin), Kalawalla 10:1 Extract (Maltodextrin), Biotin. Magnesium Stearate and Silicon Dioxiade are used as the anti-caking agents in 'Concept II'. The purpose of using anti-caking agents in the production is to prevent materials get sticking together. Is Artefact’s Concept II allergen-free? Our vitamin K2 is derived from soy. As we always emphasise, everybody has a unique health situation, upon noticing hints of allergic response, cease intake immediately. Consult your physician for further advice in case of multi-morbidity or uncertainty. Is Artefact’s Concept II non-GMO? Yes, all our ingredients are non-GMO. Is Artefact’s Concept II non-irradiation? Yes, all our ingredients are non-irradiation. Are there any gluten and nuts in Artefact’s Concept II? How does the product smell like? It has a very light earthy smell. What is the capsule shell made of? The capsule material is derived from vegetable Cellulose, it is called HydroxyPropy MethylCellulose. These capsule does not contain wheat, gluten, preservatives, gelatin, starch or animal related products. It is 100% natural. Where is Artefact's Concept II manufactured? Our products are all manufactured in the United Kingdom. We partner with one of the UK's leading food supplements manufacturers who is supplying to more than 40 countries. The main reasons we chose to produce in the UK is to support British businesses, to be a 100% British brand, and to ensure the highest production standard with EU compliances. We source our ingredients in the United Kingdom. All sourced ingredients are EU regulated and approved. We have a very strict policy, a Certificate of Analysis must be presented and the lab tests must meet the EU safety requirements. We emphasise that all tests must be done in the United Kingdom, by labs that practicing the GMP guidelines. How do you ensure the high standard of quality control? We only work with manufacturers who practice the GMP guidelines, Who obtained the BRC accreditation (Grade A), and who are reputable in the industry. All manufacturing procedures must be monitored by UK and EU responsible institutions. Other than the capabilities of our manufacturer, we have a dedicated team that is communicates constantly and cooperates closely to ensure the production quality meets all EU requirements. What is the factory capable of? Our current partner is able to produce 1 million capsules and tablets a week at its 80,000 sq.ft. facility. Furthermore, other than practicing the GMP guidelines and accredited by the BRC, the facility is being considered as one of the "1000 companies to inspire Britain 2017", it is also halal, kosher, SOIL Organic registered. Where exactly is the factory situated? A small fishing port on Yorkshire’s Holderness coast, sheltered to the north by Flamborough Head and the high chalk cliffs of Bempton, Bridlington is where our partnered factory situated. Do you use animal testing in the production? Who is in the customer service team? We think customer service is the utmost important part of our brand, so we have a team of medical experts (or doctors) to manage all inquiries. Nonetheless, we are not giving out any medical advices but answering Artefact’s products related questions. We are unable to guarantee the product is 100% suitable for everyone, as we emphasised earlier, human body is unique and differ from person to person and there is no way for us to tell if anyone could achieve the optimum effects. However, if you are not happy with our products we guarantee you a 100% money back. The only thing we are asking for is the receipt of the purchase. Why do we think communicating with our customers is so important? Communication is important in every relationship, our communication motto is "When there is an issue, we speak about it, we find solutions for it, and we solve it together." We believe in order to have a great product we need to constantly collect feedback and critiques, and continuously improve and innovate. We want to build a brand that belongs to everyone. Anyone can contact us! Write to us if you want to know more about our products, if you want to complain, if you want to share your experience, if you want to provide suggestions, and if you want to tell us that we have done a great job. I still have some unanswered questions, what now? Please write to us on the contact page and we will reply you within 24 hours. Disclaimer: The products introduced, and the statements made through this website, have not been evaluated by the United States Food and Drug Administration. These products are not intended to diagnose, treat, cure or prevent any disease, the statement contained on the labels does not imply that these products have any medicinal properties or use, if you are taking any prescribed medication or have any medical conditions always consult your doctor, pharmacist or health care professional before taking vitamins or supplements.